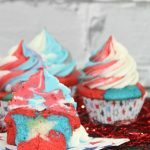 Red White and Blue Cupcakes with a hidden white star in the middle that will be sure to impress your guests this 4th of July or any other patriotic occasion! This recipe is super easy to make. Summer is here and the Memorial holiday weekend as well as the 4th of July are just around the corner. We enjoy breaking out the red, white and blue as often as we can and showing our patriotic spirit. 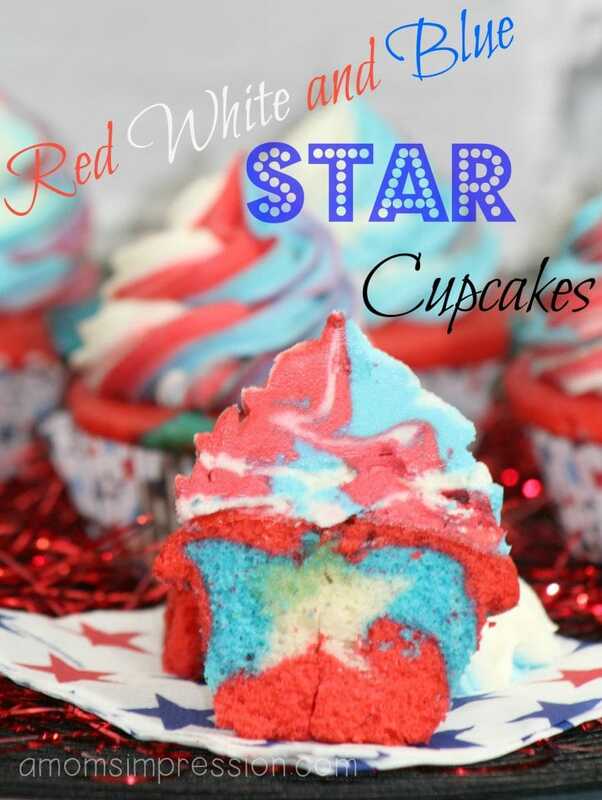 These fun red white and blue cupcakes are fun to make and everyone loves the hidden star in the middle. It might look complicated, but it really isn’t. It just takes a few steps to get it just right! For another great patriotic dessert check out our homemade edible sugar cookie dough! -Add sugar and vanilla extract to the butter until well combined. -Divide the batter into three bowls…. add red gel food coloring to one…. add blue gel food coloring to the second and the third remains white. Stir well. -Begin by spooning in some of the red batter then the blue… using a spoon twirl the two colors together. -Place your star in the center and build the cupcake…. continue with the blue batter then the red batter…. using a spoon twirl the two colors together. -The batter should reach 2/3rds of the top of the lined cupcake holders. -Spoon the white batter onto a cookie sheet and bake at 350 degrees for 24 minutes or until an inserted toothpick comes out clean. -Using a small star cookie cutter and cut out the stars for the cupcakes. -Beat the softened butter on its own until smooth. -Add powder sugar with heavy cream into the creamed butter until it becomes a smooth and thick texture. -If the frosting is too thick, add more heavy cream, if the frosting is too thin, add more powder sugar. if the frosting drops off the spoon add more powdered sugar …. -Divide the frosting into three bowls….. One bowl add several red drops of gel food coloring… stir well……Second bowl add several drops of blue gel food coloring…. stir well…. Third bowl remains white. -Scoop individual colors of the frosting at a time into a pastry bag… Start with the blue frosting, second the red frosting and lastly add the white frosting. -Twist the open end of the pastry bag to push the frosting to the tip. Test it out before applying the frosting to the cupcakes. 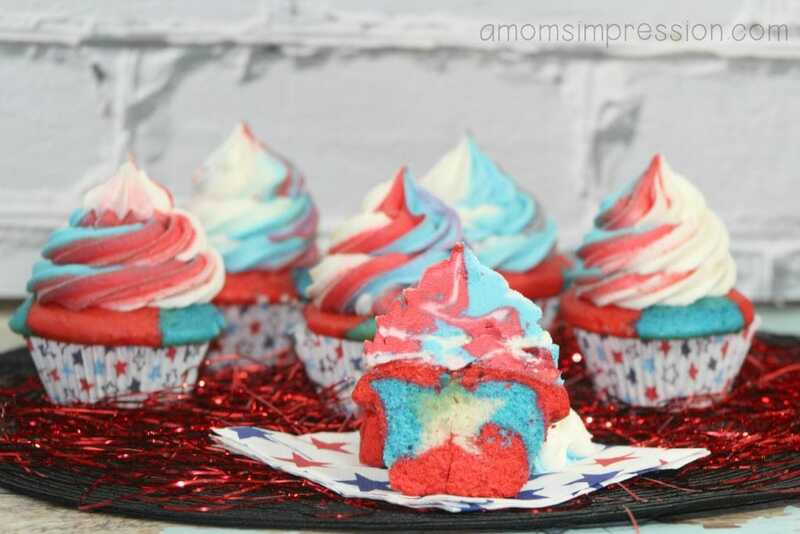 The frosting should come out in a mixture of the red, white and blue. 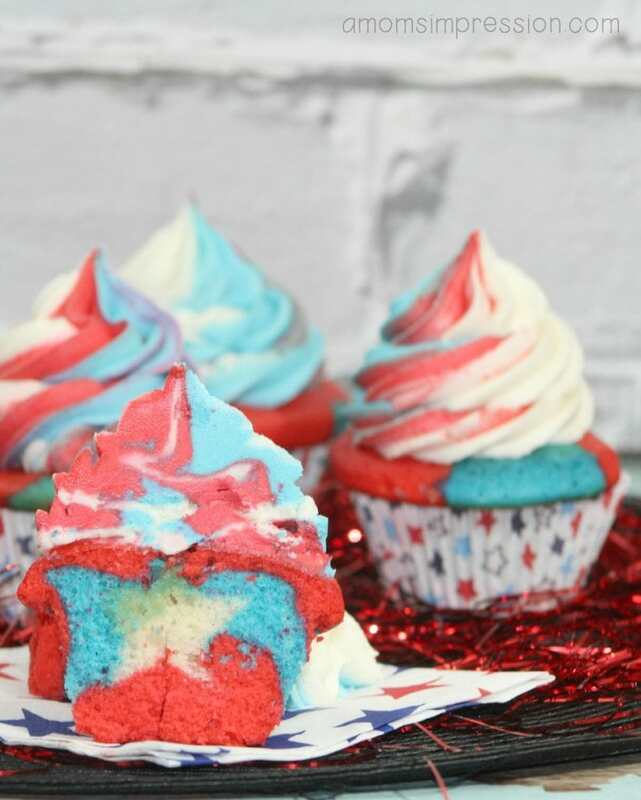 Red White and Blue Cupcakes with a hidden white star in the middle that will be sure to impress your guests this 4th of July or any other patriotic occasion! Add sugar and vanilla extract to the butter until well combined. Add 1/3 C flour mixture to the wet mixture followed by adding 1/3 C of the buttermilk; add 1/3 C flour mixture again then add 1/3 C buttermilk mix on low speed, add 1/3 C of flour and add the rest of 1/3 C of buttermilk mix in low speed until thoroughly blended. Divide the batter into three bowls.... add red gel food coloring to one.... add blue gel food coloring to the second and the third remains white. Stir well. Begin by spooning in some of the red batter then the blue... using a spoon twirl the two colors together. 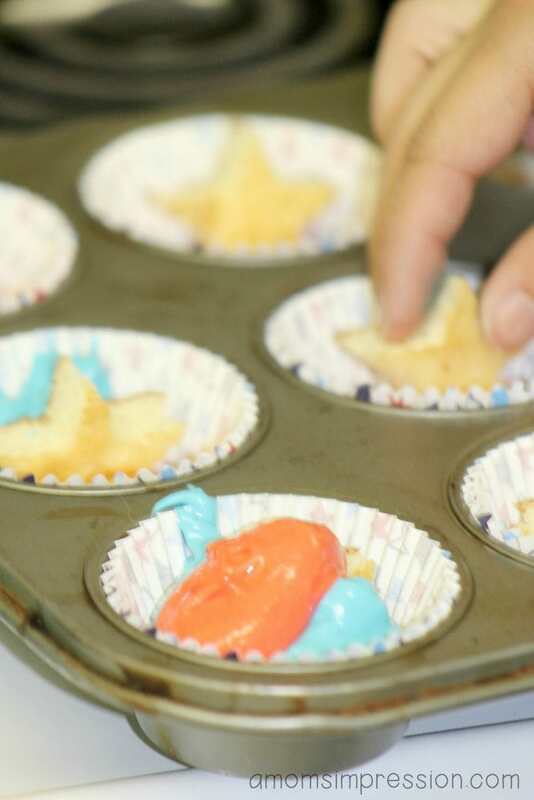 Place your star in the center and build the cupcake.... continue with the blue batter then the red batter.... using a spoon twirl the two colors together. -The batter should reach 2/3rds of the top of the lined cupcake holders.